After cutting the fabric, I arrange pieces for the blocks on individual squares of newspaper and stack them on a large square ruler. This allows me to sew the pieces together correctly without a lot of hassle or confusion. Do you use a similar system? The most used and most authentic symbol of the Holy Spirit is the descending dove. It is based on the account of the baptism of our Lord. 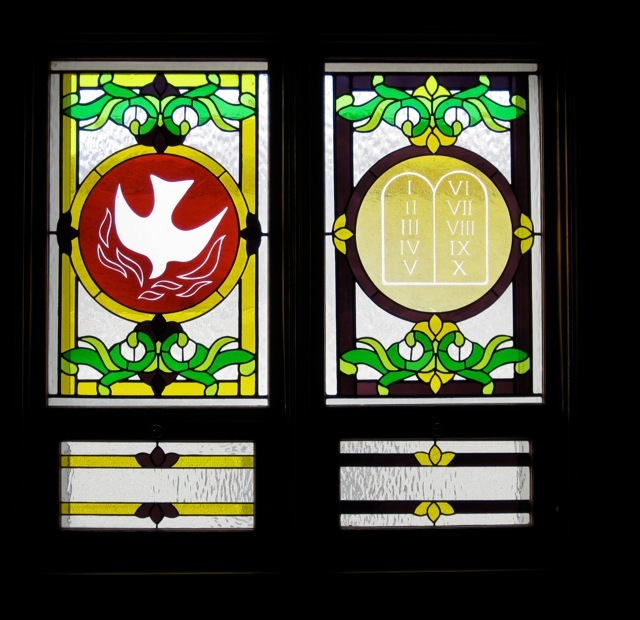 The dove is one of the earliest forms used to represent the Holy Spirit. 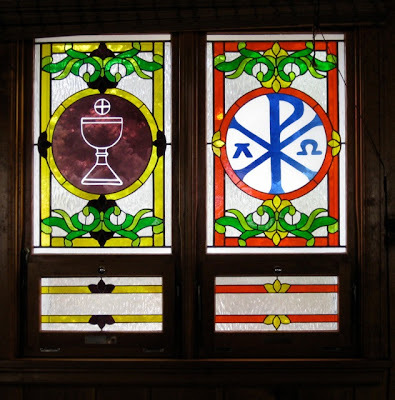 This window includes seven flames which refer to the seven gifts of the Holy Spirit as taken from Revelation 5:12 - power, riches, wisdom, strength, honor, glory, and blessing. When man fell into sin, the knowledge that he had of God's will, written in his heart, was sadly blurred, yet not entirely effaced, a remnant remained. The natural knowledge of the Law is true, as far as it goes, but it is not perfect. In order that we might have a better knowledge of God's Law, He revealed it on Mount Sinai, as recorded in Deuteronomy 10:2, "At that time the Lord said unto me, Hew thee two tables of stone like unto the first, and come up unto me into the mount, and make thee an ark of wood, and I will write on the tables the words that were in the first tables which thou brakest." 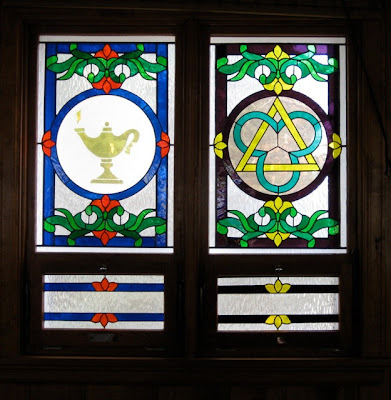 The symbol on this window reminds us of the Ten Commandments and our duty to "love the Lord, thy God, with all thy heart, and with all thy soul, and with all thy mind, and thy neighbor as thyself." It wasn't much to look at then and definitely isn't now. On-base and off-base housing was scarce, and when something came available, it was taken whether you liked it or not, and for the record I took it, but I didn't like it. 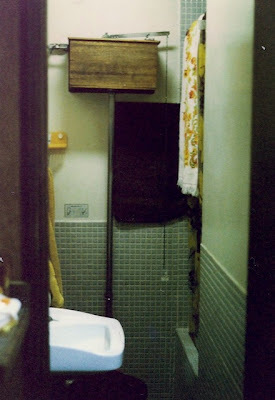 The front door went into a tiny utility room that housed a kerosene hot water heater and a minuscule washer and dryer. More about the hot heater later. The utility room opened into the main section of the house where the living room and kitchen melded into each other. The galley kitchen was tiny. Notice how low the cabinet is by the stove. I'm 5'8" and really had to stoop to use the kitchen sink that was in that cabinet. 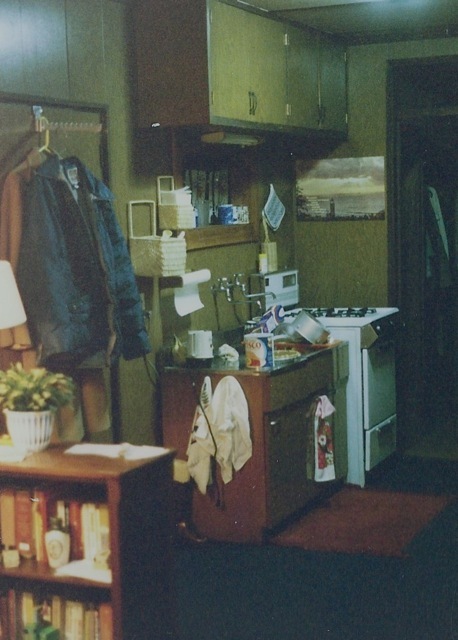 The refrigerator was directly across from the stove, and the bathroom door was adjacent to the refrigerator. The bedroom was through the doorway between the stove and refrigerator. The living room was also tiny. The object in the lower left corner of this photo was the heating source for the house - a kerosene heater. "Heater" is almost a misnomer for this object, as I nearly froze to death during the long winter. I don't think the house had much insulation. All of the furniture in the house, except for the director chair - a gift from friends, was military issue. The amount of furniture allowed was determine by rank (yes, civilians were ranked, based on experience and education). Government service (GS) ranking determined everything (housing, salary, and even social status). In 1979 - 80, my classification was GS 11. Now let's continue the house tour with the bathroom. Sorry, the door does not open all the way, as it is hitting the refrigerator. Some closets are larger than this bathroom. The shower stall was also a step-in tub. I don't advise trying to take a bath unless you like squatting. Do you see the small sign on the far wall? Shhh, don't tell my landlord, but I took it. Self-explanatory, I think, but wouldn't it be fun to know what it says? For some reason I didn't take a photo of the bedroom. Let's just say it was also tiny and just as dreary. 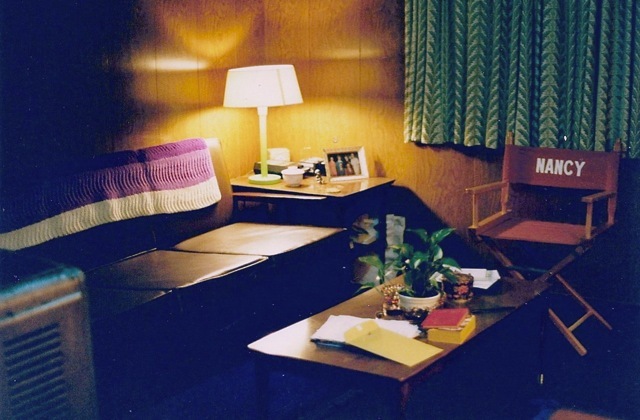 Part of the reason the house seemed so depressing was the dark paneling and few windows. It was probably a good thing there weren't a lot of windows because the house would have been even harder to heat. As I mentioned, the heater needed kerosene as did the hot water heater. The fuel was delivered by a tanker truck, and it was very important not to run out of fuel. Since I didn't speak Japanese and my landlord didn't speak English, it was difficult to coordinate the delivery of this precious liquid. One time I ran out of kerosene only to discover that one of the tanks had been leaking, an expensive discovery. Side note: It appears that many homes in Japan are still heated with kerosene. 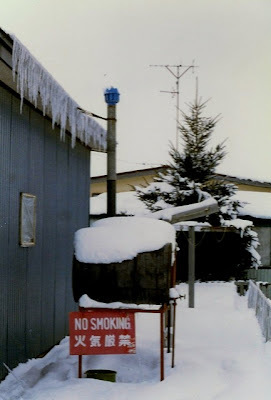 Tanya, who currently lives in Japan, reflects a dislike of kerosene heaters in a recent blog post. Now about the hot water heater, it ran on kerosene and was extremely finicky. 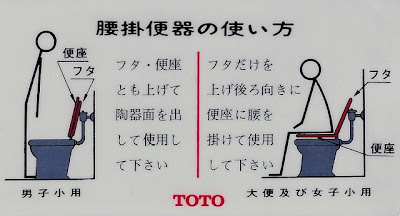 The wind would extinguish the flame at the base of the water tank. Relighting it required crumpling newspaper, setting it on fire, and dropping the ignited paper down the center of the tank to a basin that contained a pool of kerosene. Often it would not light on the first or even second try. One night, I tried numerous times to light the growing pool of kerosene at the base of the hot water heater. Then suddenly, in a loud WHOOSH, the kerosene lit, shooting flames out the pipe on the house roof, and it sounded like a jet plane was preparing for take-off. The chimney pipe from the hot water heater to the roof was glowing a brilliant orange. I truly thought the house would go up in smoke as I stood outside and watched. 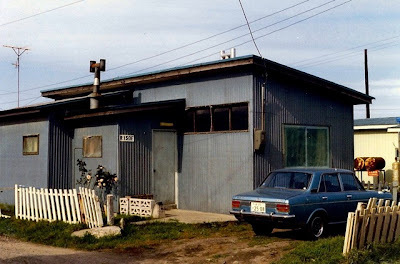 I hated this house and wanted to move so badly, and I checked to see where my name was on the list for a BOQ (bachelor officers' quarters) apartment on-base every week. Whenever my name got close to the top of the list, new officers, ranking higher than me would transfer in and bump me down the list, lower than where I started in August. It was depressing and seemingly hopeless. I feared I would have to stay in this depressing house the entire year. In March and April, two more house blocks will join Mary's Winter House and Anna's Spring House to complete the Quilter's Neighborhood. The Original version of Anna's Spring House on display in the shop used brighter fabrics. My BOM kits will all feature Thimbleberries fabric. 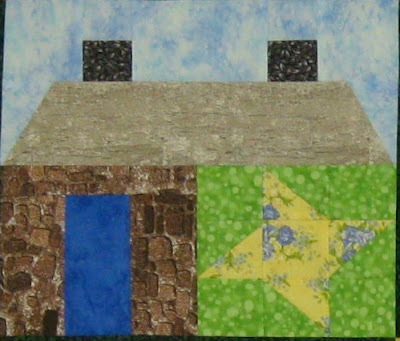 The Quilter's Neighborhood is the Free Block of the Month program at Sheep Camp Quilt Supply. 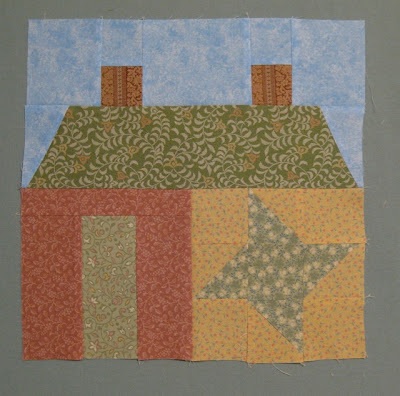 The first four months will focus on houses: one house is decorated for a each season with a quilt block. The following four months will feature trees dressed for the season, and then another set of four designs to finish the row quilt. The blocks can also be used for table runners or pillows. The program was supposed to begin in January, but the kits were not ready. On Saturday, I picked up both January and February's kits. 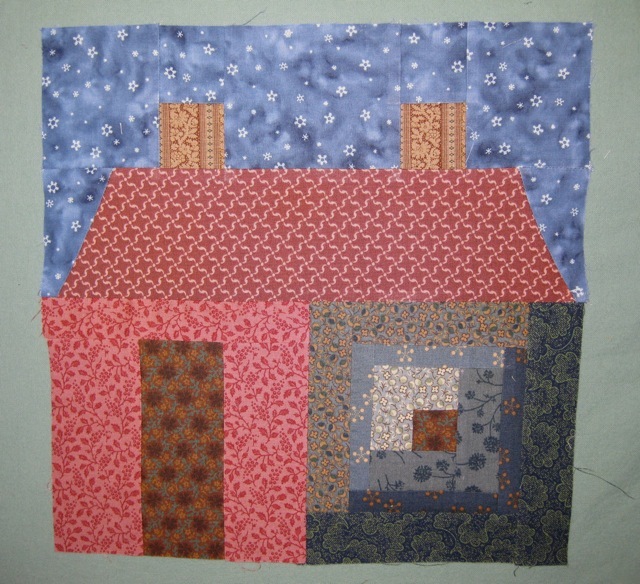 The first kit (the pattern and enough fabric to make the block) was $10, and if the finished block is shown the following month, the next one free. If I do not finish the block in time, to stay in the program, I must purchase the next kit. By completing the blocks in the allotted time, I will have 12 blocks for the original cost of $10. The shop offered a choice between the Original version (photograph of the shop display) or the Thimbleberries version. I chose Thimbleberries because I like the muted colors. 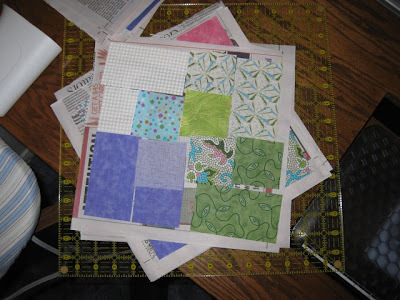 Each block will measure 12 inches when assembled in the quilt top. 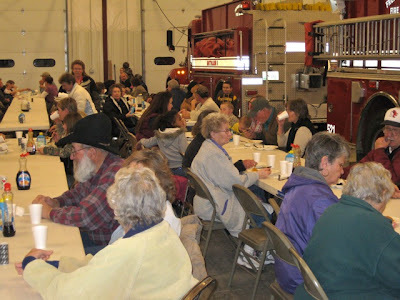 Thursday evening I joined friends at the Morton-Kinnear Fire Department Pancake Supper. As always, the food was plentiful, hot, and delicious. 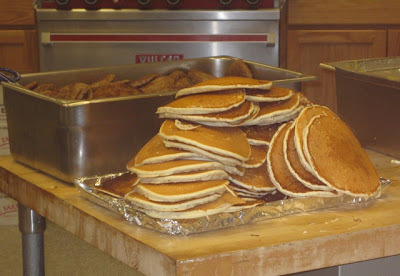 They served pancakes, sausage, eggs, coffee, and milk. Believe me, if anyone went away hungry, it was their own fault. The firemen even served seconds (or thirds) of everything at the table. Held annually, the supper is a major fund-raising event for the volunteer fire department, but it is also a place to visit with friends. 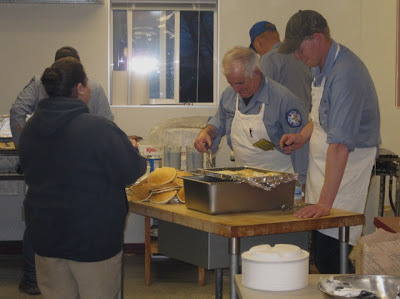 These men have mastered the meal preparation and serving, and they are great fire fighters, too. 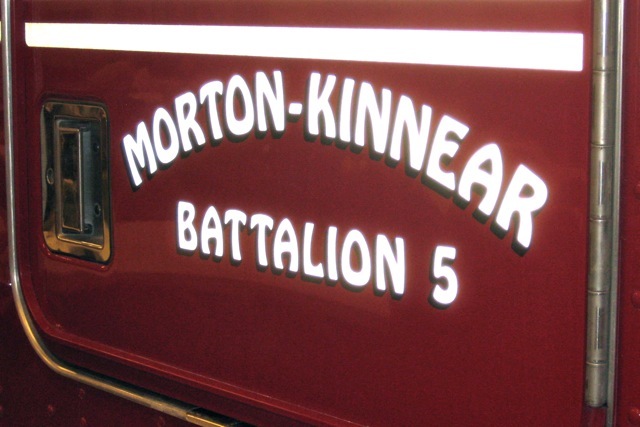 The Morton-Kinnear Fire Department is one of several battalions which make up the Fremont County Fire District. 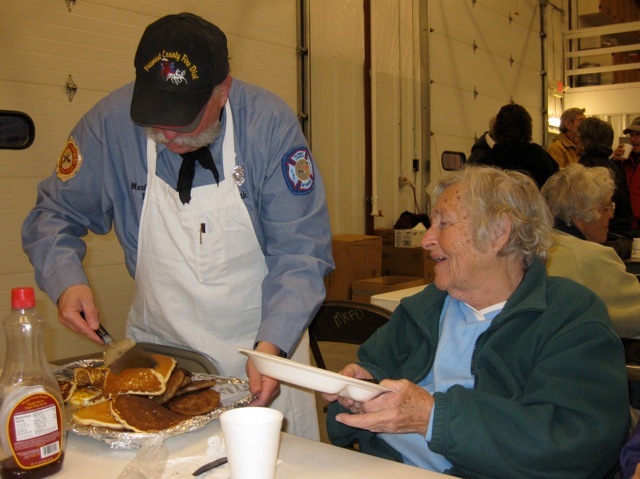 The District covers an area of 6,000 square miles with 200 volunteer fire fighters. 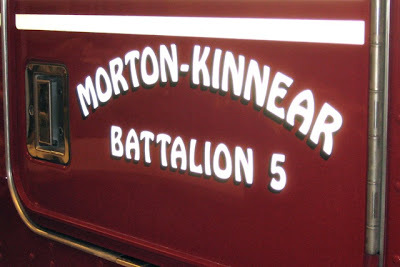 The new Morton-Kinnear fire house was dedicated in July 2009. In the Book of Psalms states, "Thy Word is a lamp unto my feet, and a light unto my path." One of the most popular symbols for the Word of God is the Lamp. The significance of the lamp as a symbol of God's Holy Word is that the Bible is not some dark difficult book which ordinary people should not read, but it is a "light unto our path," clear enough for us to understand, pointing and showing the way to "salvation through faith which is in Christ Jesus." In the Holy Scriptures, God has revealed Himself as the Triune God: Father, Son, and Holy Ghost, three distinct Persons in one divine Being. This symbol shown in the window is the most commonly used symbol of the Holy Trinity - the equilateral triangle with the trefoil. In this symbol, God the Father, God the Son, and God the Holy Ghost are represented as being equal parts of a triangle whose sides are equal. As the triangle would be incomplete without one side, so the Holy Trinity is incomplete unless we worship all Three Persons: Father, Son, and Holy Ghost. The trefoil is a familiar emblem of the Trinity in modern Christian Churches. Sometimes this stands alone without the triangle. It is simply a modification of the three circles of equal size with the overlapping parts cut out. 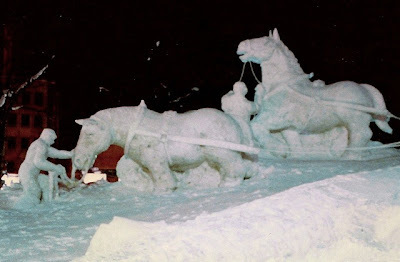 We toured some of the snow sculptures at night. This was one of my favorites. It didn't have the detail of the sculptures we saw the next day, but the emotion it conveyed was still strong. It was massive and impressive from every angle. If I remember correctly this was in the international section, where groups from other countries created entries, but I am not sure. I don't remember if prizes were awarded at the festival. 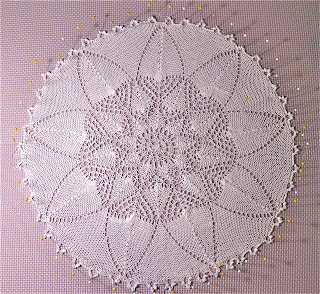 Dahlia, measuring 16 inches in diameter, was knit on size 2 circular needles, using Aunt Lydia's Crochet Thread (size 10). 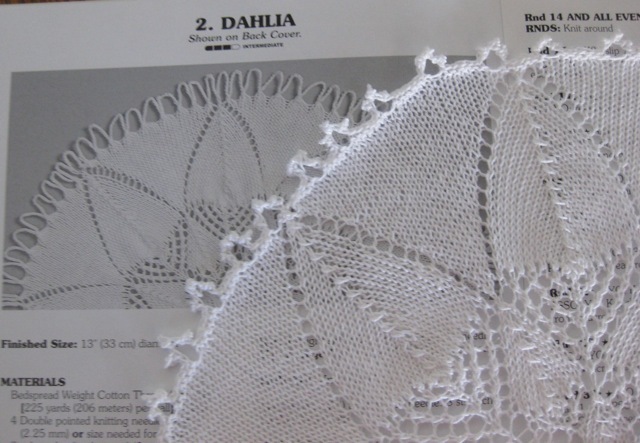 Dahlia is one of three doilies featured in Fresh Knit Doilies by Larisa Scott, published by Leisure Arts. One adjustment to the pattern, because I am inept with a crochet hook, was the knit edge. I will use the stitch again since it complements the design more than the crochet one and I doubt that I will ever master a crochet hook. The stitch, called Crown Edging, can be found on page 86 in knit edgings and trims, edited by Kate Haxell. In an earlier post, I showed other edgings from the book. Blocked and starched, Dahlia is displayed on my front room coffee table. 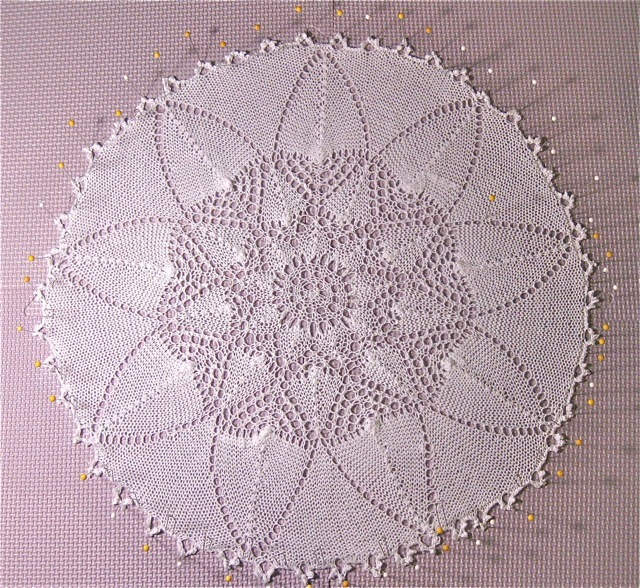 The doily is finished and being blocked (right side down). I'm very pleased with how it turned out - mistakes and all. 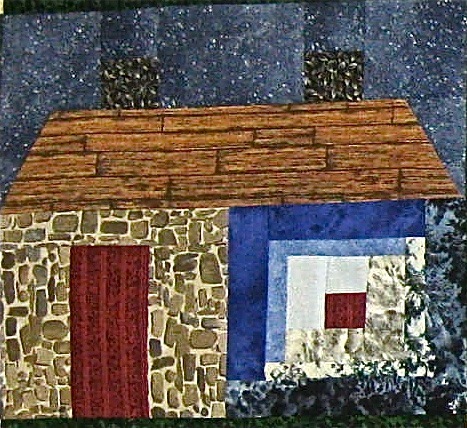 When it is dry, I'll post photos of the front and the edging that I used. 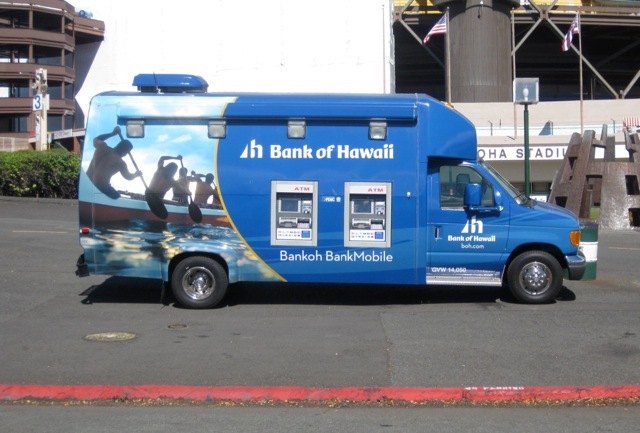 I guess we really are a mobile society. 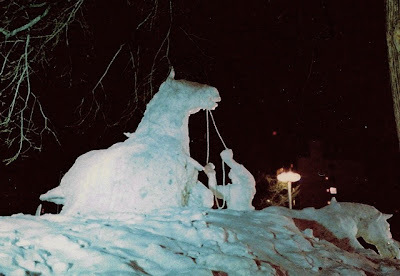 Have you seen anything like this in your area? Due to an abundance of coal, oil and other minerals in the area, Gillette, WY is booming town. Because housing is so tight, workers, today, often live in campers and families live in motel rooms. It was no different 38 years ago when I was assigned to complete eight weeks of student teaching in Gillette. I knew housing would be a problem, so I contacted the church to see if someone in the congregation would be willing to rent a bedroom for eight weeks. Mrs. Cannon, an elderly woman, graciously invited me to live in her home. 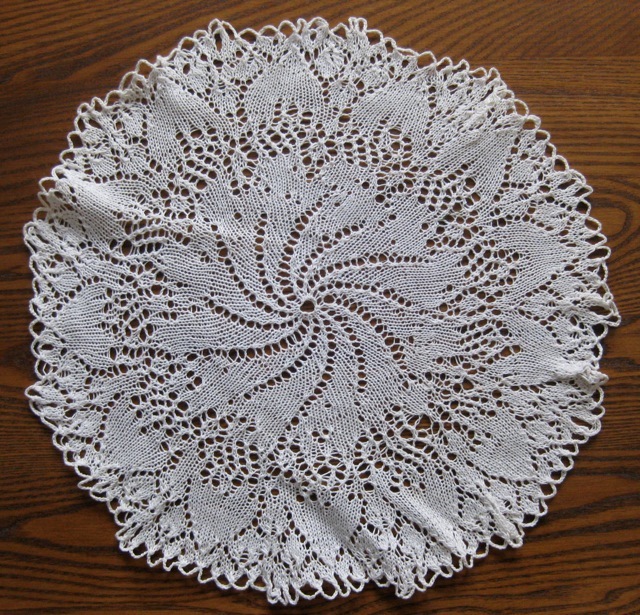 Mrs. Cannon was an accomplished knitter, and knitted doilies (the first I had ever seen) were displayed everywhere in her home. It wasn't long before she gave me the confidence to start one of my own. When I didn't have school obligations, Mrs. Cannon and I would knit together in the evenings. 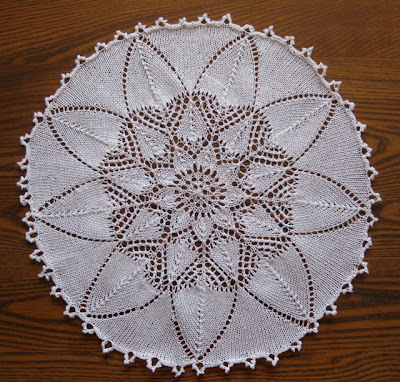 She was so proud when I finished my first doily (pictured above). It was my first experience with double-point and circular needles and even knitting lace. 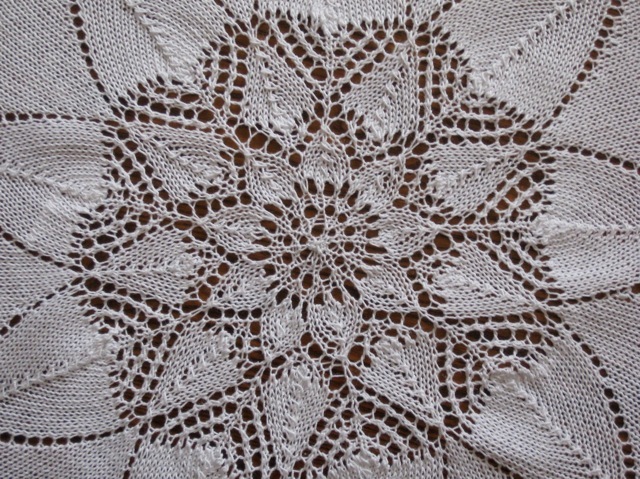 I vowed to knit another doily, but for one reason or another, it didn't happen. 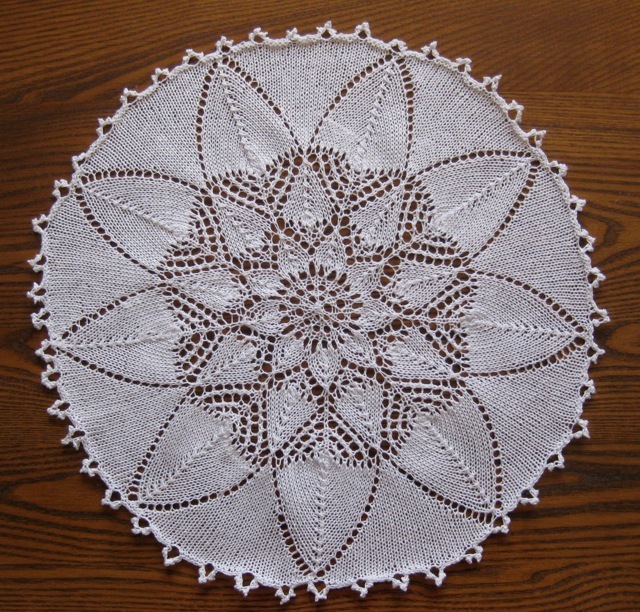 Over the years I searched for knitted doily patterns and even downloaded several patterns I found online, but they became "someday" projects and never materialized. 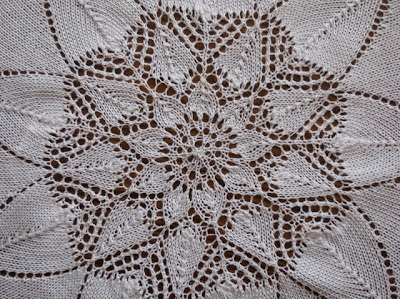 You can find some beautiful lace doily patterns here or shawl patterns like this beauty. Note the additional pages listed to the right of those pictured. Someday, I hope to make this Spiral doily or this gorgeous Heirloom doily. Last year, when I saw this book in Hobby Lobby, I decided I had to knit one of the easy patterns by the end of the year. I think Mrs. Cannon would approve of my efforts. I've made great progress since this photo was taken, and now the edging is beginning to intimidate me. You see, I don't crochet and all of the projects in this book have a crochet bind-off. Since I am inept with a crochet hook, I am searching for an edge that can be knit. One of the best loved symbols is that of the Chalice and Wafer which symbolizes the institution of the Lord's Supper. These objects are used in Christian art as an aid to worship, reminding us of the night in which Jesus was betrayed as well the institution of the Lord's Supper for the forgiveness of our sins and for the strengthening of our Christian faith. The Chi Rho monogram is the oldest used with reference to Christ and is sometimes called a "Christogram." 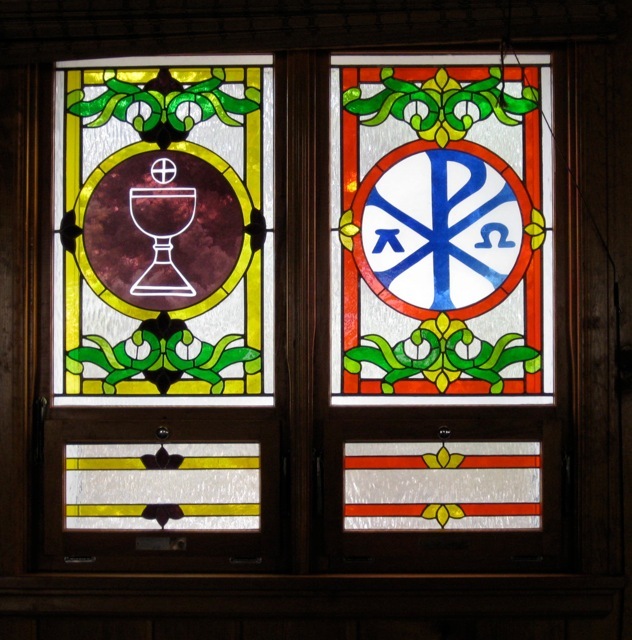 The Christogram on this window also includes the first and last letters of the Greek alphabet - Alpha and Omega. This usage is based on Revelation 22: 13 - "I am the Alpha and Omega, the first and last, the beginning and the end." These were added to symbolize the divinity of Christ - that He truly is true God. Pachinko Parlors were common in Japan in the 80s. 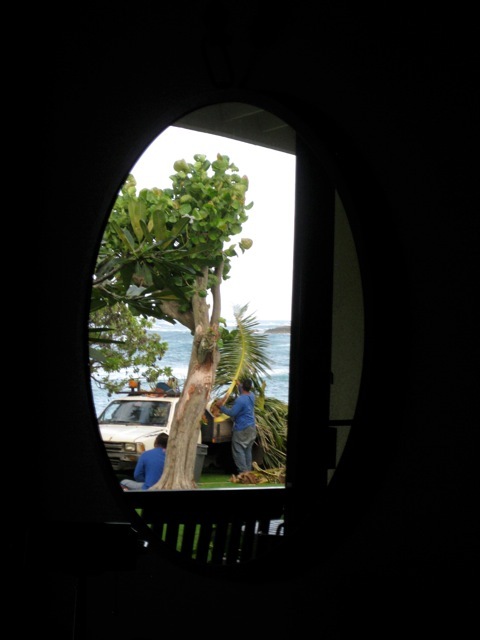 The store fronts were all glass on the front to allow the passerby to see into the parlor. 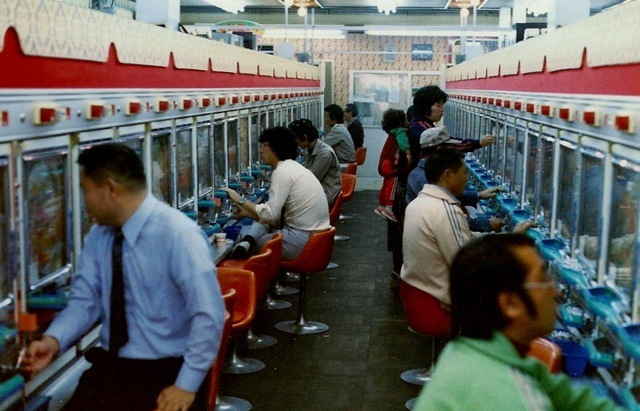 The windows, doors, and every other uncovered area were lined with flashing lights, attempting to lure customers. I didn't understand the concept of pachinko, but I did play once with a friend. 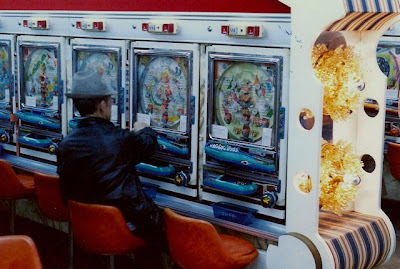 Pachinko is a pinball machine on steroids. If you look closely at the photo, you will see a tray of small balls. These are the tokens for the machines, much like older slot machines used quarters or tokens. 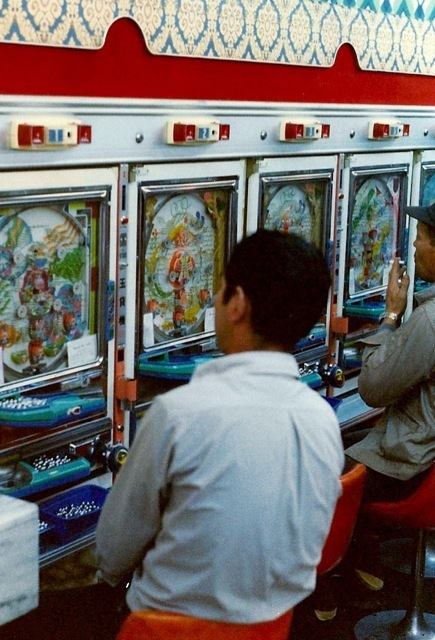 The balls could be "cashed in" for prizes, but not money since gambling was not legal in Japan. Usually, the players collected cigarettes with their tokens. 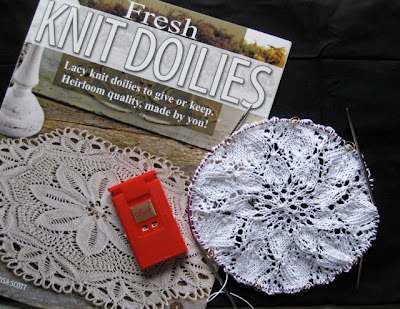 On her IrishEyes Knitting Blog, Kathy B. invited readers to participate in a Take and Replace swap. She divided the respondents into two teams (Green and Red) which she determined by location north or south of Interstate 80. I was assigned the Green Team (north). Green and Red are in competition to see which team's box returns to Kathy first. She will draw one name from the winning team for an additional treat. The bulging box arrived at my house on Tuesday, and when I opened it, the contents burst out. Luscious fiber treats (I can't tell what was in the box because it would spoil the surprise for the next person) filled an entire table. 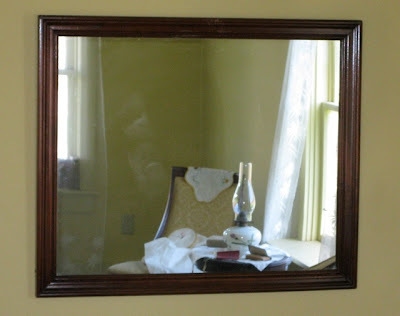 Determining what to keep was difficult: I wanted all of it! 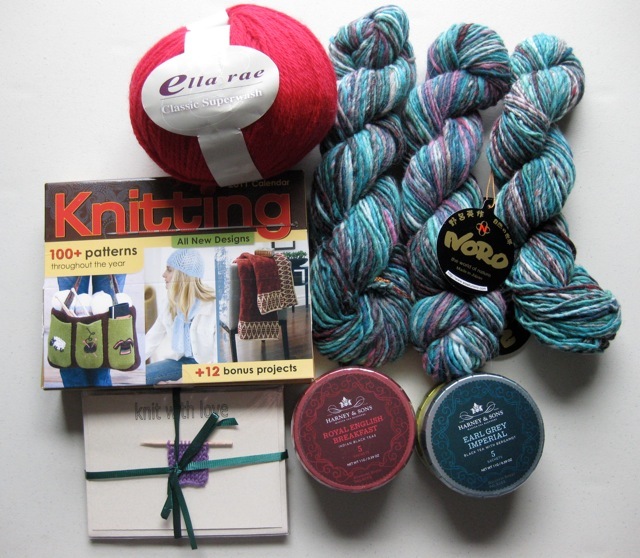 Finally, I made my decision and removed the items pictured above: a 2011 knitting calendar, some homemade cards, a variety of tea, a skein of red superwash wool, and three skeins of Noro. Yesterday, the box was repacked with the remaining items and the items I added to replace my takes. A bulging Medium Flat Rate Box ($10.95) is now on its way to Salem, NY. Kathy, thank you for including me in the swap. I had a lot of fun.